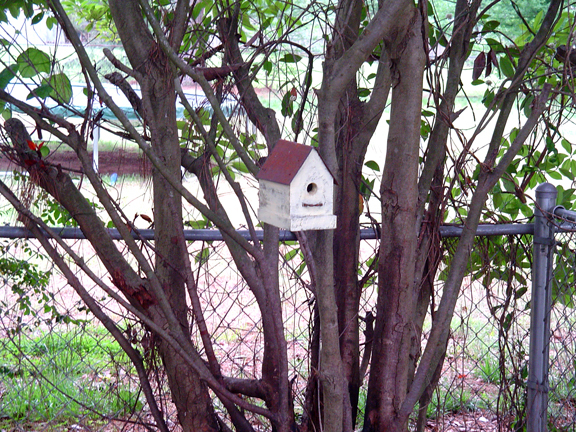 I bought this whimsical little bird house on Etsy this past winter. For a long time I had it sitting on a little table on my patio, enjoying it as a decoration. But then when the weather started warming up, I hung it down in the corner of the yard where there is plenty of cover for nest building. It wasn’t long before Mrs. Chickadee had built her nest and laid her eggs. I didn’t realize it until I was sitting on the patio and she caught my eye darting in and out of the bird house. It’s amazing to watch Mama and Papa Chickadee pop in and out of that tiny hole. They seem to just sail right in and then just as fast, they’re gone again. I don’t like to go too close for fear of disturbing them, but I’ve been close enough early in the morning to hear the little peep-peeps. So exciting! Here is the link to the Etsy shop Bacon Square Farm for bird houses and all kinds of other wonderful whimsical and rustic things for your house and garden. You are such a farm/country girl! LOL Just like me! 🙂 I do love watching as your beautiful new home blossoms and grows. Your gardens look Awesome! Hope you keep us posted with those as well. Love the colors of yours! Looks so cute and rustic. I’m sure the little chickadees are very grateful for their new home. Great story how the birds have made a nest and found this birdhouse in your yard, they are so interesting to watch, nature is incredible. how wonderful to have a family in!! The parents must feel really secure with your lovely birdhouse. I have been leaving many finger sized rolled collections of Arabella’s and Wesley’s fur for the birds and it has been taken immediately. Arabella is still moulting slightly and Wesley always has lots of fur on the fleeces. Though I have yet to see a nest with it in. I too love watching your new home blossom, it all looks and sounds just so “you”. It seems too that your creativity has really taken off in all sorts of interesting and new directions since you moved in. It is just so amazing to be able to share in it from halfway round the world, for years I have lived in this small country isolated at the ends of the earth. Now part of the “global village” – awesome.